REWARDING physical activity with digital activity is the mission of new Australian-designed wearable technology Elanation. Hundreds of children and parents have bought the eTurbo wristbands and engaged with its protected online community since co-founders Katherine Pace and Aimee Atkins launched the product in December 2016. "We created a digital ecosystem where children are rewarded in entertaining ways for engaging in physical motion. We love the fact that kids get online, get inspired and then go outside," Pace, the Elanation CEO, tells Business News Australia. The idea came from Atkins, who has had a long career in children's entertainment and was the original Dorothy the Dinosaur for The Wiggles. Having seen The Wiggles get thousands of kids up and dancing, Atkins was keen to do her bit to help parents while also tackling important social issues such as childhood obesity and cyber bullying. The result was Elanation, which encourages children to be physically active and engage with technology in a positive way. Today, it is estimated that 77 per cent of kids play games on mobile devices and 43 per cent of kids own a smartphone, while one in three own their own tablet. "Kids today are digital natives. Parents are handing down iPads and computers and mobile phones. They are all filled with passive forms of play, though," says Pace. Elanation's eTurbo integrates exercise with gaming to make digital play active. 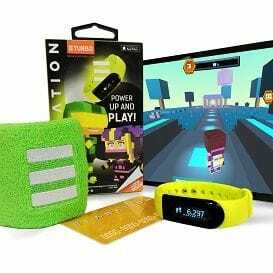 "Kids can wear their eTurbo device to athletics, to surf club they can play and know that later on they can plug in and play in the virtual world," explains Pace. By doing exercise while wearing the eTurbo band, the wearer can then unlock new Elanation digital content online. "The game caps at half an hour, so there is trust that there is no cycle of addiction within the game." Pace and Atkins saw the wearables market was booming, but also identified that there were products lacking in the 6-15-year-old age bracket. "Parents are very aware of their children's health they need a brand to help in the areas of health and fitness for their children - but they are very busy and there are a lot of products out there." "We brought together a team of experts in children's health and engineering to create a good product. It is still a new brand, we are trying to establish a level of trust and awareness across Australia, and that is definitely a challenge." Elanation, which was a participant in this year's Springboard Enterprises program, closed its oversubscribed seed round in July and went to market in September with the eTurbo. Next, the company is redesigning its website, adding different coloured wristbands for the eTurbo, and developing a 'parents' portal' product, all ahead of a move to target the United States market. To do this, the business will benefit from its series A funding round, which is set for July 2017. It is expected to be one of the most anticipated seed funding rounds in Australia this year. "When you find a real problem that is worth solving people will pay for the solutions, and they can gain a lot of momentum quickly," says Pace. What sets Elanation apart from many other startup tech companies is that it has a physical product, and Pace says this is a positive for investors. "The fact that we have got hardware has made it easier to generate revenue quite early. It's part of the reason we have been successful and the reason we have been able to scale. People have been able to understand our monetisation model."